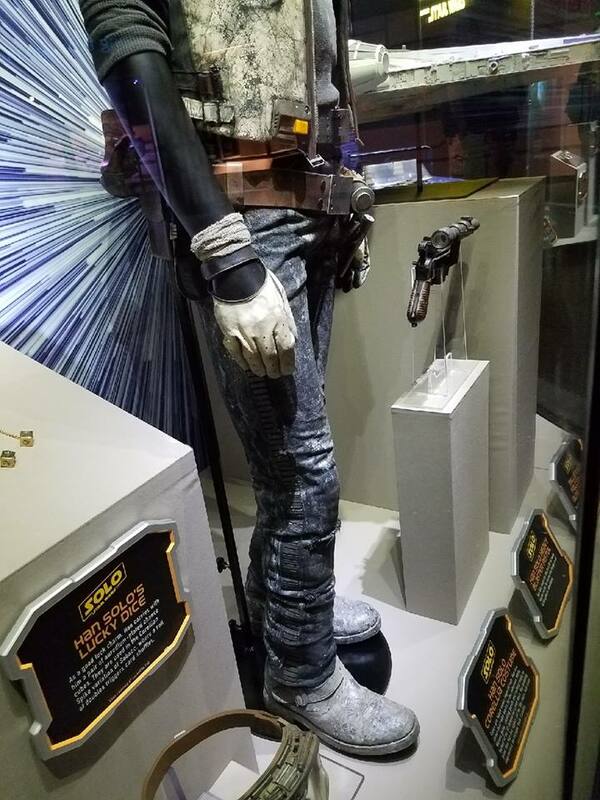 This is a thread to start putting things together for Han's Corellia look from Solo: A Star Wars Story. 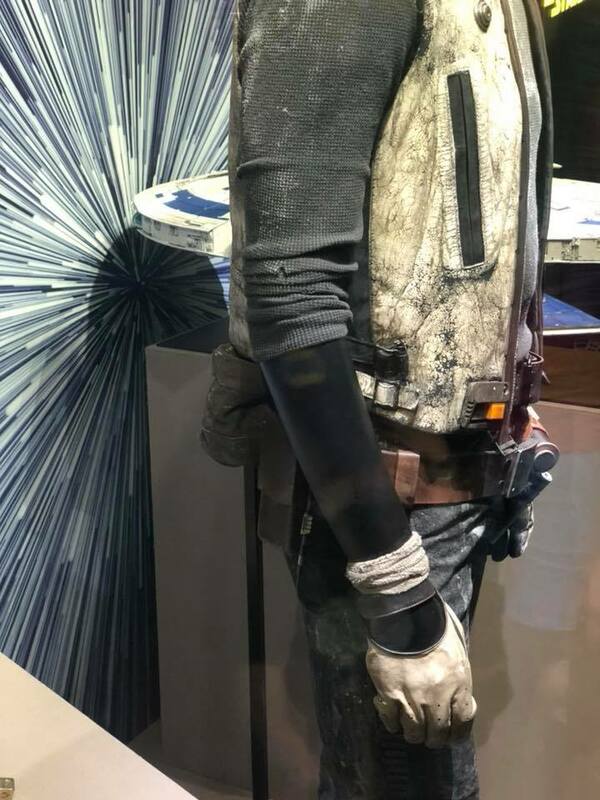 One thing I recognize right away is that the card detail at the bottom of the vest is the same as Jyn's from her vest, except the button on Han's is yellow where Jyn's is red. I'm going to go look and see how other standards have defined these things so we don't have to reinvent the wheel. 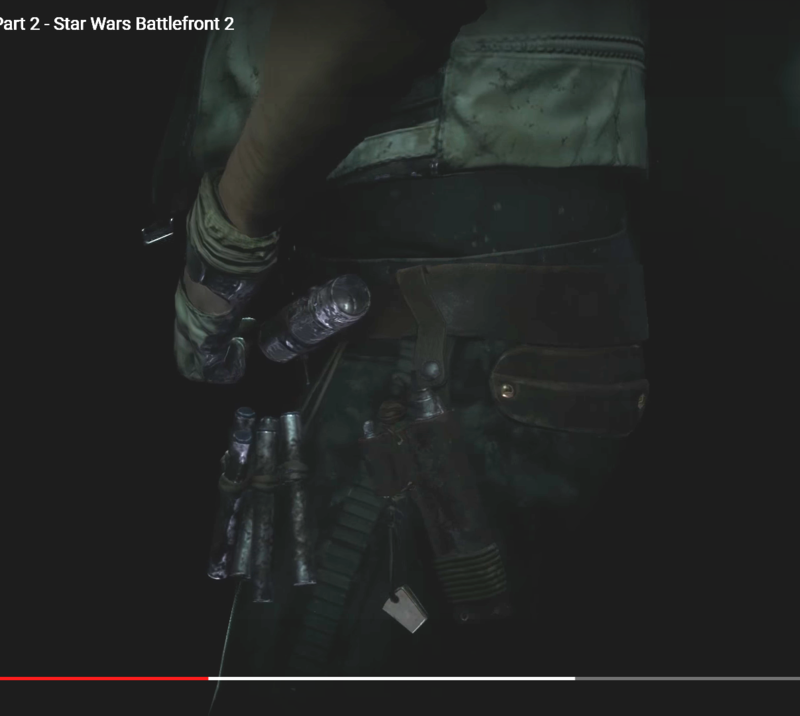 There is a card device is attached to the left side of the waistband. Card device is silver/gray with a yellow rectangular button. 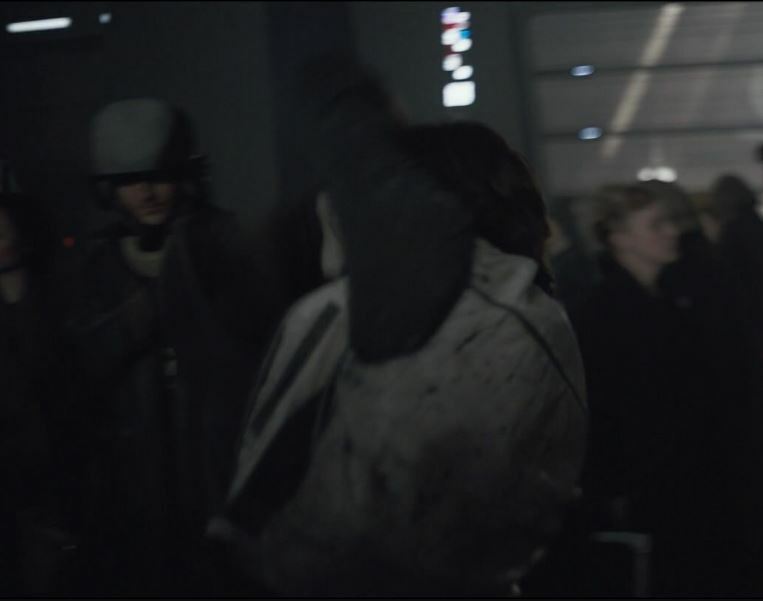 And it looks like the circle greeblies are called "Imperial Code Disks"
Hey! 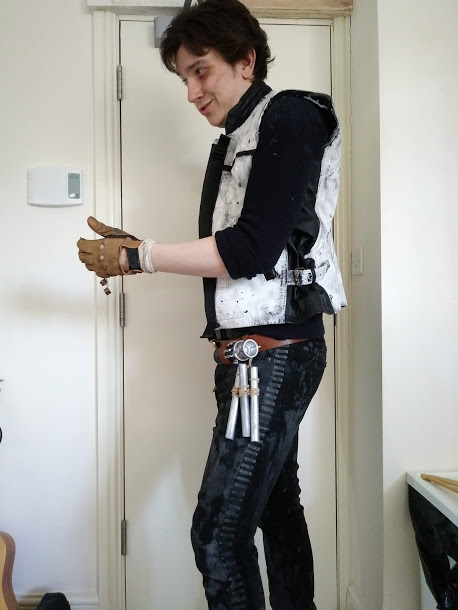 I was encouraged by Captain Solo (Evert) to jump in with the Corellia thread. 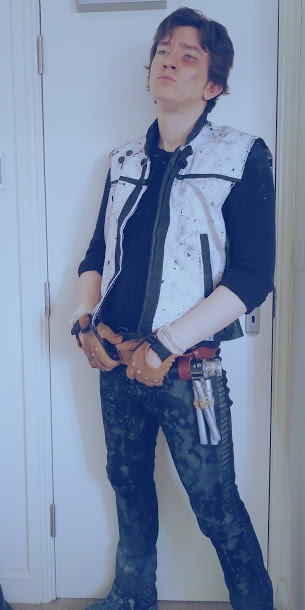 A couple of months back I worked on chucking together a relatively cost effective Corellia Han cosplay - I did this with found and modified pieces; I already owned the jeans I used (the screen used trousers had jean style frog mouth pockets), and I bought the rest really cheaply on eBay. 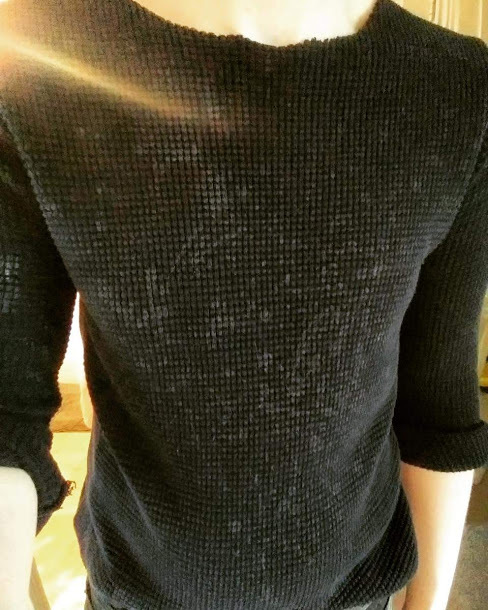 The jumper is a waffle knit which I then cut and distressed. I did this with scissors, burning, and acrylics, as well as some salt water spray. 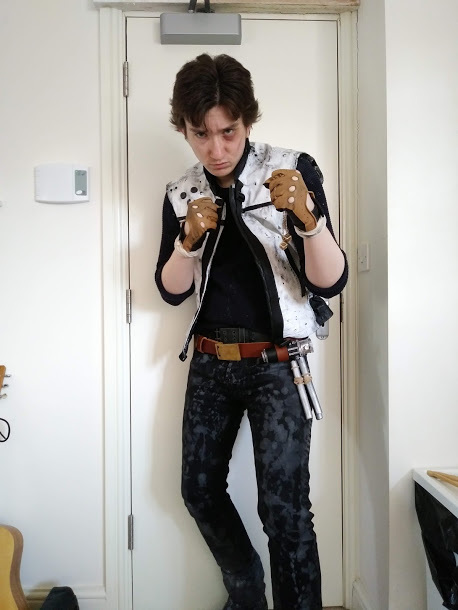 The leather vest was once a ladies leather jacket that I heavily modified, including painting, distressing and weathering. I still need to source and attach the communicator greeblie but for the most part this is done! Not totally SA but I'm pretty pleased with the result. 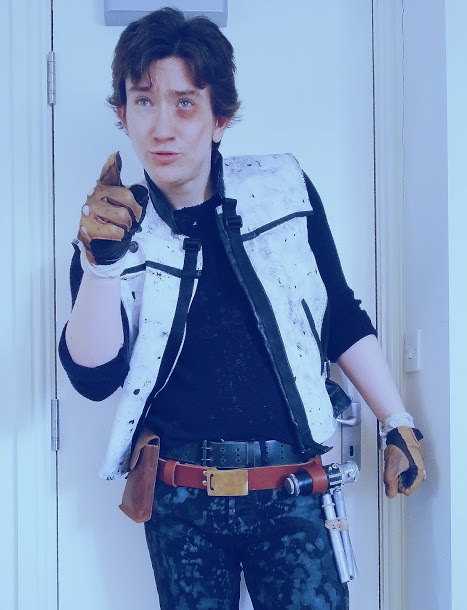 The belt was scratch built - I used a solid brass belt buckle and added the design myself (I know the SA one was silver in colour but I couldn't find a suitable one!) as well as sourcing/building the belt tools etc. 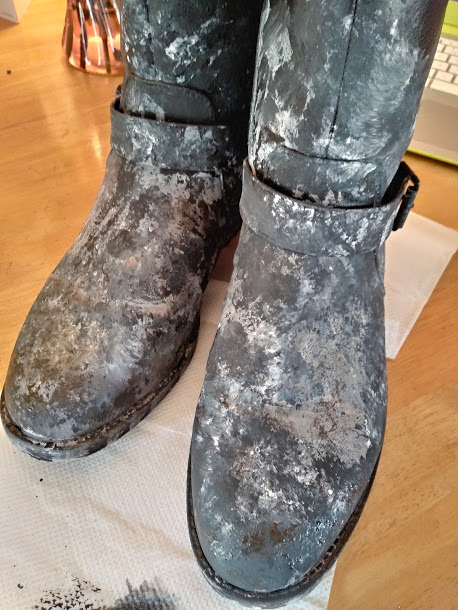 The boots were a fun weathering job. These are just cheap pleather engineer boots that I bought for a couple of quid on eBay but they really look the part. Overall I'm thrilled with this costume - I get a lot of really great reactions to it over on Instagram. It's not 100% accurate but I feel it really captures the gritty aesthetic of the movie. Hope this is of some use to somebody! Here are just a few shots of me in costume. Cheers! I love seeing your Hans come together. You capture the scoundrel spirit so well! You're so sweet! Thanks for always supporting me! Here's my attempt at the standard, with photo references to follow in the next post. *The shirt is worn tucked into the pants. 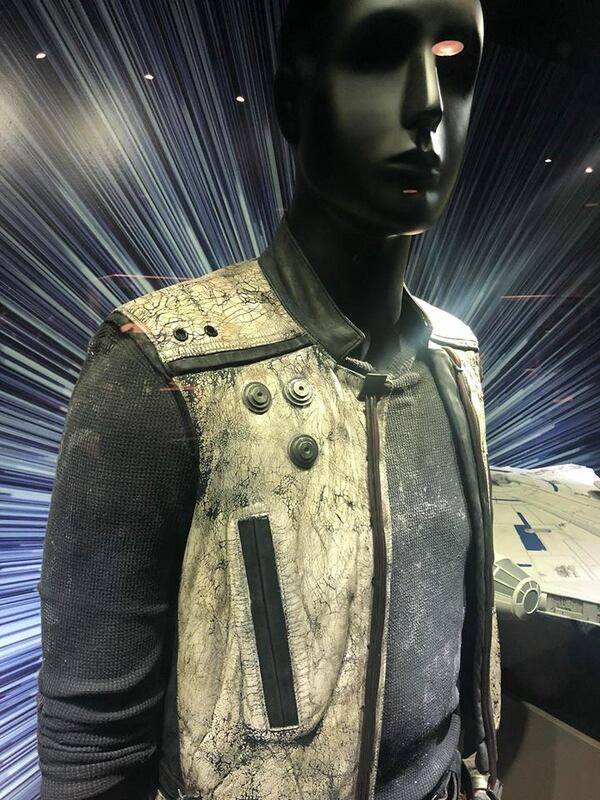 *The shirt is weathered with white "Corellia mud". *The vest is made of a leather-like material. *The outside of the vest has a crackled white finish. *The inside of the vest is a black leather-like material. *The vest has a black mandarin-style collar with topstitching along the edges. *The left side of the vest opening has a 2-inch section folded back on itself to reveal the black lining. Both sides of the vest opening have lengths of black 3-ribbed tubing/wiring attached. Accurate greeblies should be attached to the tops and bottoms of the tubing. *The front of the vest features two slanted welted pockets. 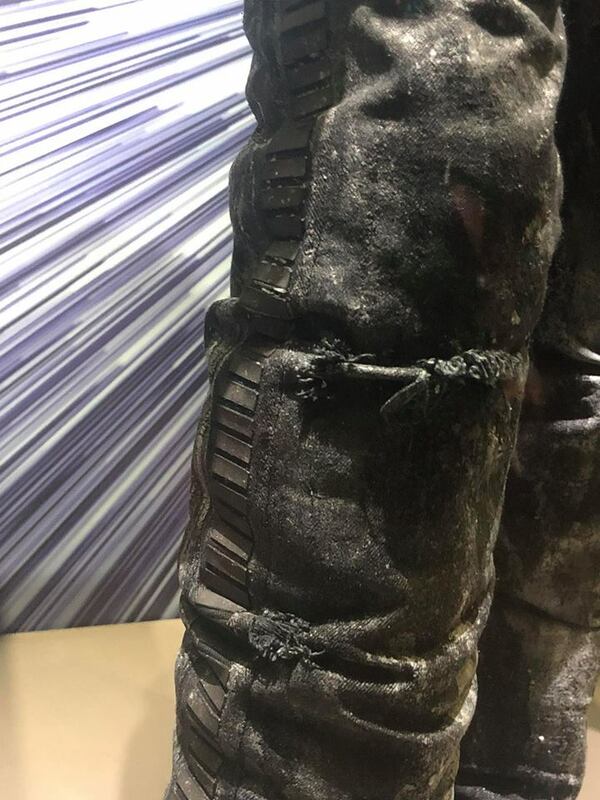 The welts of these pockets are black. *The vest has a yolk that begins on the front about 1.5" before the end of the mandarin collar. The back of the yoke extends to the middle of the wearer's shoulder blades. There is a black leather-like strip at the front & back of the yoke, with two rows of topstitching above the strips. Just under the yoke on the right side front of the vest, there are 3 imperial code disks in a triangular layout. Just above the yoke line on the right side front of the vest are 2 black grommets side-by-side. *The sleeve openings of the vest are trimmed in black leather-like material. *The backside of the vest has 2 black grommets stacked vertically just beside the left sleeve trim, above the yoke line. *The back of the vest has a large bottom waistband seam/topstitching. *There are black insets under each arm. This inset is spanned at the bottom waistband by 1 white strap with a buckle, and 1 black strap with a buckle. *There is a card device is attached to the right side of the waistband. Card device is silver/gray with a yellow rectangular button. 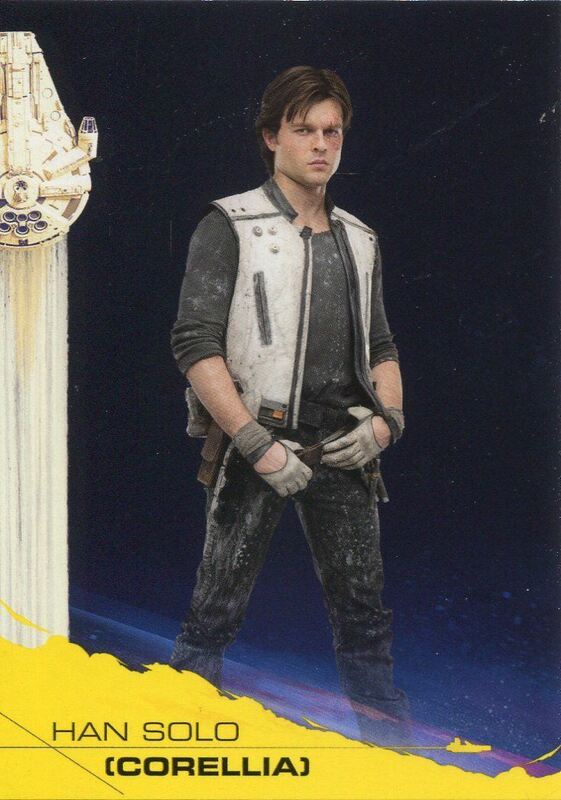 *The vest is heavily weathered in a white, paint-like substance. *The belt is punctured entirely with rows of three holes and a two-prong black buckle. 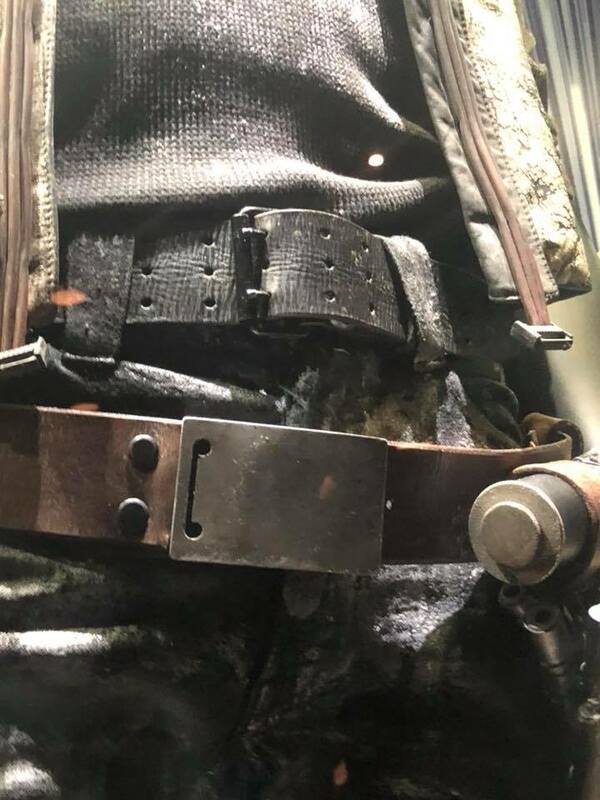 *The belt is brown leather, or leather-like, has a plain silver-colored belt buckle affixed at the center by two rivets to the right of the buckle. *Belt buckle has C-shaped cut-out on the right side of the buckle's face. 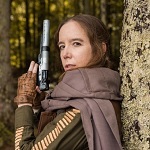 *To the left of the buckle, a brown vertical leather-like loop secures a droid caller. *Leather-like hanging Pocket secures behind the wearer's left hip and holds several tubular greeblies/tools. *Brown leather belt loop at front of wearer's right hip. *Rectangular brown pouch sits behind wearer's right hip, with no visible closures. *Bloodstripes of charcoal/black "brick vinyl" (extra thick iron-on) down outer sides of legs. *Back pockets with leather-like rounded facing/slit, showing 2 gold/brass rivets below the pocket's opening. 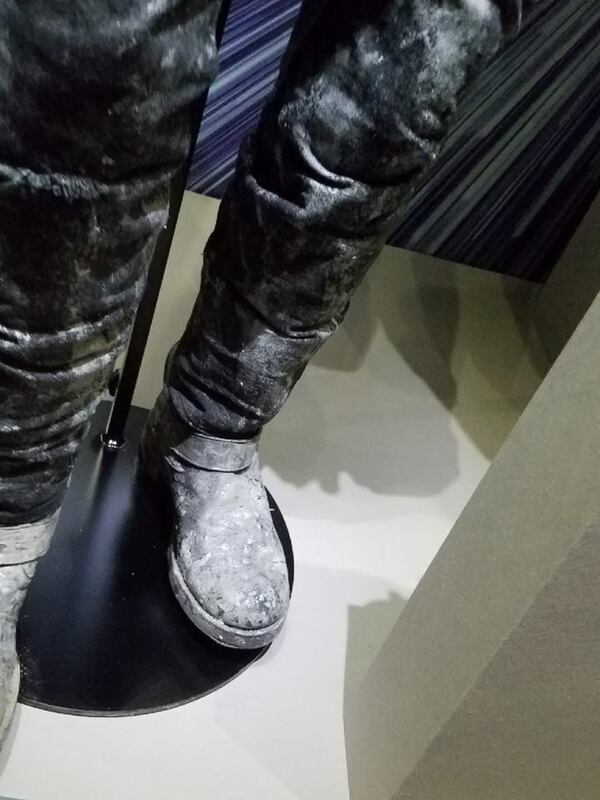 *The pants are distressed and heavily weathered in a white, paint-like substance. 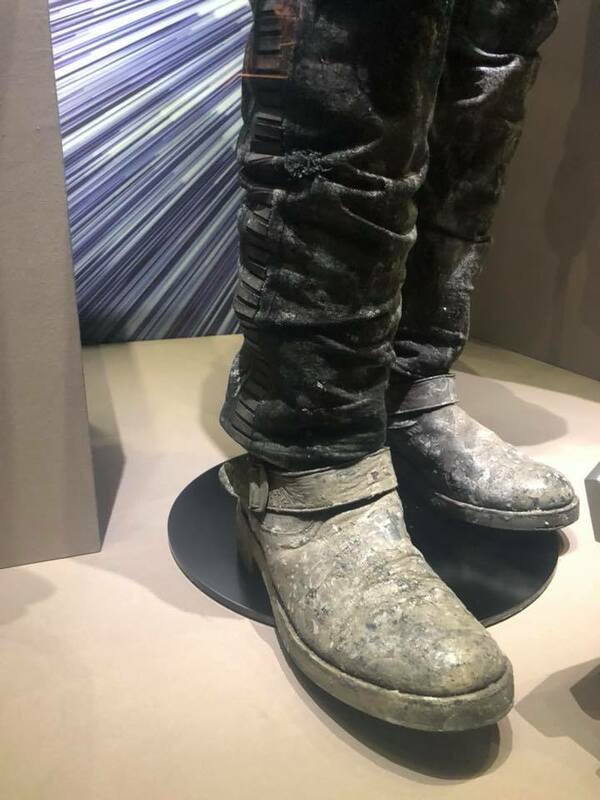 *The boots are nearly entirely covered with mud/paint-like substance. *Cream/faded yellow driving gloves with black palms and black wrist strap under D-shaped cutout. 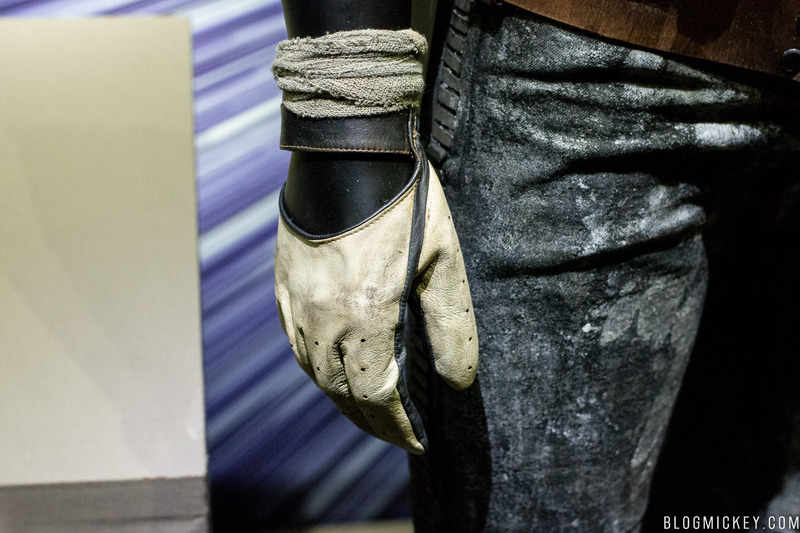 *Grayish-brown textured bandages wrapped around wrists above driving gloves.